PARCA eNews – Feb. 18, 2017 – Following implementation of the New York HIE (health information exchange), quality of care improved along with operational efficiency, resulting in considerable cost savings and improved patient outcomes, according to a study published in the Feb. 10, 2017 issue of SSRN, the journal of the Social Science Research Network. One of the first studies of the effects of HIEs, the study examined almost 86,000 emergency department encounters over a period of 19 months between July 1, 2012 and January 31, 2014 at four emergency departments linked to the HealthLinkNY Health Information Exchange. PARCA eNews – Feb. 28, 2017 – If you missed HiMSS17, held in Orlando, Feb. 19-23, 2017, or were unable to attend some sessions you can now catch recordings of more than 200 of the sessions online. Starting April 1, HIMSS will offer session recordings to allow the health IT industry to recap or experience the conference education for the first time. Will interoperability and PACS minimize the role of radiologists in patient care? PARCA eNews – March 10, 2017 – That’s the question a panel of radiologists led by Dr. J. 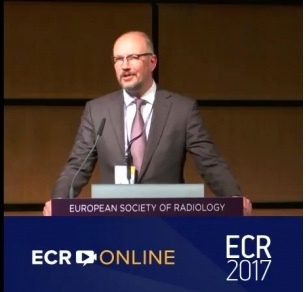 Van Goethem addressed in one of the sessions at the ECR 17 (European College of Radiologists) meeting held in Vienna March 1-5. With the advent of PACS most clinicians have gained direct and immediate access to radiology images. Many clinicians have at least the basic knowledge and capacities to interpret radiology studies and some clinicians are even highly skilled in interpreting studies in their specific field of expertise.